Speed a major key to success, China’s Lin Gaoyuan secured third place at the Liebherr 2018 ITTF Men’s World Cup in Paris on Sunday 21st October. In the bronze medal match, the no.4 seed, he beat Germany’s Dimitrij Ovtcharov, the no.3 seed, in five games (11-7, 11-9, 9-11, 11-4, 11-3). 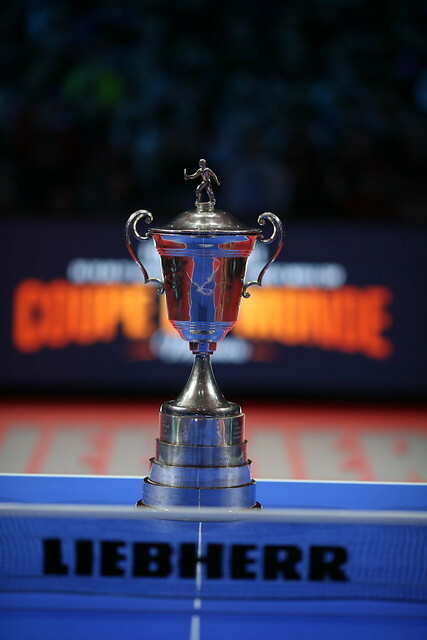 Success by the very minimal margin was the end result just under one year ago in favour of Dimitrij Ovtcharov, when they met on their one and only previous occasion on the international stage, the semi-finals of the Men’s Singles event at the Seamaster 2017 ITTF World Tour Grand Finals (7-11, 5-11, 11-9, 11-8, 11-8, 4-11, 12-10). In the French capital city the task for Lin Gaoyuan was set the record straight; quick to seize the opportunity, proving effective over the table, he clinched the opening game. Advice from Liu Guozheng, the national coach sitting courtside, Lin Gaoyuan, after trailing throughout the early stages of the second game, levelled matters at 8-all, before at 10-8 holding two game points. Against Fan Zhendong earlier in the day he had been in the same position but had then not taken advantage of the opportunities. It was different when facing, Dimitrij Ovtcharov, at the second attempt he succeeded. Trailing two games to nil, as previously, Dimitrij Ovtcharov once again made the better start in the third but at 6-5, the advantage was down to one point; he called “Time Out”. Initially he benefitted from the break, he moved ahead 8-6 but at 8-all matters were level. A reverse of the of previous game was the eventual scenario; Dimitrij Ovtcharov established a 10-8 lead, Lin Gaoyuan saved one game point but not a second; the overall gap in the engagement was down to one point. Stung by the reverse, it was a highly motivated Lin Gaoyuan who started the fourth game, more vocal than previously, greeting every success with a raucous cry; he won six of the first seven points. He never relinquished the advantage; the two games advantage was restored. Lin Gaoyuan was now in full flow, the accelerator pressed; in the fifth game, he went ahead 6-2, the advantage was never surrendered, third place was secured. Meanwhile, for Lin Gaoyuan, in Paris it was new adventures; last year on debut he departed in the quarter-finals; this year in the French capital city it was the third step of the podium.